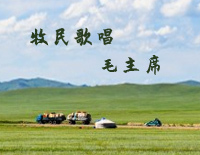 Herdsmen Sing of Chairman Mao EOPM is provided for you and if you think it can be optimized such as adding the dynamics etc, welcome to provide us with the more perfect Herdsmen Sing of Chairman Mao EOP and EOPM! Herdsmen Sing of Chairman Mao is a piece of piano music composed by Hu Shixi. The melody is quite happy and beautiful, expressing the deep affection and admiration of great leader of New China.